a descriptive statement is one that “does not articulate a promise to act, but describes a status, condition, policy” (about the details of the contract). For promissory statements, Rutledge suggests using “will”, (she’s not into “shall”, “must” or any other construction of obligation for promises of the parties, as talked about here). For descriptive statements, use the present or past tense. And, while we’re talking about tenses, Rutledge, also tells us what type of tense to use in the recitals: past and sometimes present. This advice is particularly useful to keep in mind when translating Spanish contracts so you don’t get caught up in the whirl of future tenses usually rife in them. You can keep the future simple for promissory statements (if you don’t use “shall”), but it’s usually a good idea to get rid of a lot of them for descriptive statements. If you’ve been translating contracts for a while, this advice is sure to gel because you probably automatically replace the future tense with the present on many occasions in descriptive statements, typically found in housekeeping clauses about things like the term and the governing law. agreement, performance, obligation, discretion, prohibition, policy, conditions, declaration, belief, intention and recommendation. Adams suggests, in each case, which tense and often even which verb is most appropriate. While this may seem overkill, his guidelines are actually very straightforward and easy to apply (post to come on this*), and I believe we should be aiming to understand the different types of contract language to this level of detail and be translating accordingly. But, in any case, remembering the promissory-versus-descriptive distinction is a good first step to breaking the spell of the predominant future tense in Spanish contracts. 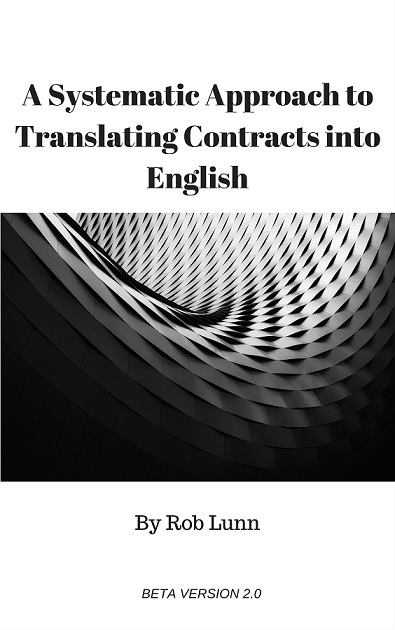 * I’m still to write this post, but you can find these guidelines and detailed advice on what tenses and verbs to use where in my ebook on translating contracts (available here). See sections 3.1 to 3.3 in Chapter 3. These are great posts. I haven’t got your books but others but need to look at them again. I would disagree with your grammar terminology. I would not call ‘will’ in this context a future tense, but a modal form indicating a promise (which makes it particularly appropriate). I may post on this some time. I don’t know anything about those Spanish future tenses, of course. I think you’re right about that classification of “will” here. Although Rutledge does use the term “simple future tense” in her book, I avoided using it in the post, at least when referring explicitly to “will”, but mainly because “simple future” seemed to also include “going to”. I hadn’t really thought about what “will” actually was here. In Spanish, though, I’m pretty sure the future is still called the future when it expresses obligation/promises. And yes, there is a lot of useful info in these drafting books! Cheers!